The beginnings of Rome are shrouded in obscurity. The city was situated on the left bank of the Tiber, about 18 miles from its mouth. Though it is known as the city of the seven hills, the original Rome was built on one hill only, the Palatine; but the neighbouring hills were successively included, and about the middle of the 6th cent. BC, according to tradition, a wall was built to enclose the enlarged city. The whole circuit of this wall was about 5 miles, and it was pierced by nineteen gates. Within the walls was a large area of vacant spaces, which were gradually built on later, and at the beginning of the Empire (roughly middle of 1st cent. BC) not only was the city congested with buildings, but large areas without the wall were also covered with houses. 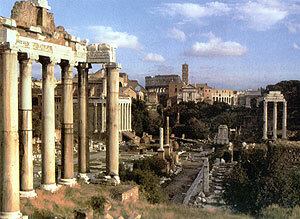 The Roman Forum; an open space measuring over 300 feet in length, and about 150 feet in breadth, was the centre of political, legal, and commercial life. At one end was the rostra or platform, from which speeches were delivered to the public; at the other end were shops. It was flanked by the senate-house and law-courts. On the top of the Capitoline Hill was the Capitolium, or great temple dedicated to Jupiter, Juno, and Minerva, and on the Palatine Hill the principal residence of the Emperor, and the Temple of Apollo, containing the public libraries, Greek and Latin. In the Imperial period four additional fora were built, devoted entirely to legal, literary, and religious purposes?the Forum Iulium begun by Julius Caesar, the Forum Augustum built by Augustus, the Forum Transitorium completed by Nerva, and the Forum Traiani built by Trajan?the most splendid work of Imperial times. Near the Viminal Gate in the E. lay the camp of the Praetorian guard (since Tiberius), to which Paul must have been conducted. On the 'Vatican Mount' W. of the Tiber lay the Circus of Gains and Nero, where Peter may have been martyred. Various estimates of the population of Rome in the 1st cent. have been given: 2,000,000 seems not unlikely. All nationalities in the Empire were represented?among them many Jews, who were expelled by Claudius in A.D. 50, but returned at his death four years later. Slaves constituted a great part of the population. The Romans began as one of the members of the Latin league, of which, having become presidents, they eventually became masters. After conquering Latium they were inevitably brought into conflict with the other races of Italy, over most of which they were sovereign by about the middle of the 3rd cent. BC. The Roman State was at first ruled by kings, but these gave place to two rulers, known later as consuls. Their powers were gradually circumscribed by the transfer of some of their duties to other magistrates. The period of steady accession of territory was coincident with a bitter struggle between the patrician and the plebeian classes, both of which comprised free citizens. The contest between the orders lasted for about two centuries, and at the end of that period all the offices of State were open equally to both. This was not, however, the establishment of a real democracy, but the beginning of a struggle between the governing class and the mass of the people, which eventually brought the Republic to an end. The civil wars, which during the last century of its existence had almost destroyed it, had shown clearly that peace could be reached only under the rule of one man. The rise of Rome to almost universal power represents a remarkable history of diplomatic and military triumphs. After lower Italy had been subjugated (by 266 BC) Rome faced the power of Carthage, which held Sicily. The latter was swiftly taken in the First Punic War (264-241 BC) and in 238 BC Sardinia and Corsica were also seized. In the second Punic War (218-201 BC) Hannibal from his base in Spain crossed the Pyrenees and the Alps and invaded Italy. He was eventually defeated at Zama in Africa (202 BC). In 201 BC Carthage had to cede Spain to Rome and hand over its navy. The Romans now turned their attention toward the East. At Cynoscephalae they defeated Philip v. of Macedon, who had supported Carthage. The effort of the Seleucid king, Antiochus in., to establish himself in control of the straits leading to the sea of Marmora led to a clash with Rome that ended with his defeat at Magnesia in 190 BC and involved the loss of all Seleucid possessions W. of the Taurus. In the second Macedonian war king Perseus was defeated at Pydna in 168 BC and the country annexed. Greece now was also subjugated and Corinth brutally destroyed (146 BC). In the third Punic War (149-146 BC) Carthage was destroyed by Scipio Africanus. In 133 BC Attains of Pergamum bequeathed his realm to Rome. The attempt of Mithridates of Pontus, from 95 BC on, to expand the influence of his realm into western Asia Minor and Greece led to Sulla's victories in Greece and to a temporary peace in 85 BC After Sulla's death in 78 BC Pompey, as leader of the Senatorial party, came to the fore. He was given extraordinary powers to put down the piracy rampant on the Asia Minor coast, and then became commander in the East, where he concluded the third war with Mithridates of Pontus in 64 BC and gave the coup de grace to the Seleucid realm. He created Bithynia and Pontus as a province, and also Syria as another province. It was at this time (64 BC) that he took a hand in the affairs of Judaea. The two-consul system which Sulla had replaced with dictatorship was restored under Pompey and Crassus in 70 BC. But Pompey became sole consul in 52 BC. Meanwhile Caesar had become a great factor through the successes he had won in his campaigns. In 49 BC came his break with the Senate and the beginning of a civil war. His victory over Pompey at Pharsalus in 48 BC and his success in the Egyptian War in 48-47 BC led to his being made dictator for ten years in 46 BC and for life in 44 BC. His assassination robbed him of the fruits of his great achievements. Mark Antony sought to succeed to his role, but Caesar's adopted son Octavian, with Senatorial aid, forced the creation of a triumvirate. Antony took command in the East, and Octavian, who soon ousted the triumvir Lepidus, had control in the West. In the battle ofActium (31 BC) Octavian won the supremacy. He was given the title of Augustus and in addition bore the family name of Caesar. He ruled as autocrat under constitutional forms: the appearance of a republic was retained, but the reality was gone, and the appearance itself gradually disappeared also. The Imperium Romanum now had at its head an Imperator (whence our words Empire and Emperor). For the city of Rome the Empire was a time of luxury and idleness, but the provinces entered upon an era of progressive prosperity. The Emperor was responsible for the government of all provinces where an army was necessary (for instance, Syria), and governed these by paid deputies of his own. The older and more settled provinces were governed by officials appointed by the Senate, but the Emperor had his financial interests attended to by procurators of his own even in these. Under the Empire the provinces were much more protected against the rapacity and cruelty of governors than in Republican times. The Emperors themselves stood for just as well as efficient administration, and most of them gave a noble example by strenuous devotion to administrative business. The resident Romans in any of the forty-two provinces consisted of (1) the officials connected with the Government, who were generally changed annually; (2) members of the great financial companies and lesser business men, whose interests kept them there; (3) citizens of coloniae (or military settlements), which were really parts of Rome itself set down in the provinces; (4) soldiers of the garrison and their officers; (5) distinguished natives of the province, who, for services rendered to the Roman State, were individually granted citizenship. Such must have been one of the ancestors of St. Paul. The honour was not conferred on all free male inhabitants of the Empire till AD 212, and in NT times those who possessed it constituted the aristocracy of the communities in which they lived. 6. The Jews and Rome. Under the Maccabaean rulers the Jews had become virtually independent of the moribund Seleucid realm. In their rise the diplomacy of the Romans, who aided and abetted all enemies of the Seleucids, may have played a role. In 1 Mac 8 is vividly reflected the impression made on the Jews by Rome. Whether there was any historical basis for the alleged treaty with the Romans at the time of Judas Maccabaeus or not, the sending of an embassy to Rome to seek their support is plausible enough. A renewal of the treaty is claimed for the time of Jonathan (1 Mac 12.1-4) and again of Simon (1 Mac 14.24, 15.15-24). Hyrcanus (134-104 BC), too, had Roman support (Ant. xii,. ix. 2 [259 ff]; xiv. x. 22 [190 ff]). The quarrel between the sons of Alexander Jannaeus (103-76 o.c.) was judged by Pompey in 63 BC, and as Aristobulus acted suspiciously Pompey seized Jerusalem and terminated the kingship of the Hasmon-aean house. During Caesar's campaign in Egypt (48-47 BC) Antipater, an Idumaean, and his son Herod (q.v.) succeeded in gaining the favour of Caesar and were given control of the Jewish kingdom. The favour of Antony and subsequently of Augustus led to the kingship of Herod (37-4 B.C.) over all Palestine and adjacent northern districts. In his testament, Herod divided his realm. The division was approved by Augustus, but Archelaus. who had the most important share, was soon deposed (AD 6) and Judaea put under imperial government. The procurator resided at Caesarea. One of the incumbents of the office was Pontius Pilate (q.v.). Under Caligula (AD 37-41), Herod Agrippa was made king, and for a few years (AD 41-44) the situation existing in the days of Herod the Great was virtually restored. At Agrippa's death, however, Rome again took over direct control of Judaea. Rising Jewish terrorism led to open rebellion in AD 66, and this to the campaign of Vespasian and Titus which resulted in the devastation of Palestine and the destruction of Jerusalem in AD 70. The arch of Titus in Rome is a surviving monument of this event, as are the Judaea capta coins. A tax, the so-called Fiscus Judaicus, was imposed on all Jews of the realm in place of their old Temple-tax. Under Domitian (AD 81-96) strict measures against the Jews continued. Under Nerva (AD 96-98) things were less strict; there was even a coin bearing an inscription that accusations based on the annual Jewish tax were now set aside (Fisci Judaici calumnia sublata). Under Trajan (AD 98-117), however, it became apparent that the Jews were a menace to the Empire. In his effort to subdue the Parthians the Jews of Mesopotamia offered strong resistance, and Jewish revolts broke out in Egypt, Cyrene, and Cyprus. It required the sending of strong military forces to master the situation. Lucius Quietus carried on a war of destruction against the Jews of the Euphrates-Tigris lands and Martius Turbo in Egypt and Cyrene. In Cyprus the Jews were exterminated and their kin forbidden the island. The synagogue of Alexandria, famed for its beauty, was destroyed. Quietus was about to proceed against the Jews in Palestine, where they had again become numerous, when Trajan died and Hadrian (AD 117-138) succeeded him. The new ruler was inclined to moderation, and held friendly talks with the Jewish Patriarch, Joshua. After the latter's death, Akiba, a proponent of active rebellion, came to the fore, and leagued himself with the political leader and insurrectionist Barcochba (c 132; his real name and title, preserved in a papyrus from Wadi Murabba'at near the Dead Sea, were 'Simeon ben Kosebah, Prince of Israel'). Even the Samaritans and pagan mercenaries participated on the side of the Jews in this fantastic venture. The Roman commander Tineius Rufus was unable to control the situation. Hadrian recalled one of his best generals, Julius Severus, from Britain, and sent him to Palestine with the necessary troops. The country was subjected, the final tragedy taking place at Beth-ter (Bittir) S. of Jerusalem. Tineius Rufus was again put in charge of the region, and no Jew was allowed to set foot in Aelia Capitolina, the newly founded city on the site of Jerusalem. A temple of Aphrodite was built on the site of Golgotha, a temple of Jupiter on the site of the Jewish Temple in Jerusalem and also one in place of the Samaritan temple on Mount Gerizim. With the accession of Antoninus Pius, AD 138, Roman policy became more tolerant. While Aelia was still closed to them many Jews returned to the land of their fathers and devoted themselves to peaceful pursuits. Circumcision, which had been forbidden, was again allowed. 7. The Christians and Rome. Christians were at first considered a Jewish sect by the Romans. But when the Jews disowned them this posed a difficult situation. Anti-Christian actions by the Roman authorities arose chiefly out of the refusal of Christians to worship the deified past emperors and the state gods. Nero's persecution was local and represented a whim rather than a policy. Domitian was the first emperor to claim divinity for himself. A persecution in his time in the province of Asia is reflected in the Revelation of St. John. Under Trajan occurred the martyrdom of Symeon of Jerusalem and Ignatius of Antioch, as well as the persecution in Bithynia under Pliny the Younger (see his Epistles, x. 96-97). Hadrian in an order issued to the governor of Asia discouraged active attempts to bring Christians to trial. Antoninus Pius (AD 138-161) discouraged anti-Christian tumults, but various martyrdoms occurred in his time, notably that of the aged Polycarp of Smyrna (AD 156). Marcus Aurelius (AD 161-180) renewed the law against superstitious cults, thus causing a state of danger for Christians. In his time Justin was martyred at Rome (AD 165), and there were martyrs in Asia Minor and in Gaul. Under Commodus (AD 180-192) there were scattered persecutions in N. Africa, Asia Minor, and Rome. The period from Decius (AD 249-251) on was one of planned persecution. That ruler, as well as Valerian (AD 253-260) and Diocletian (AD 284-305), vainly sought to destroy Christianity. The victory of Constantine over the usurper Maxentius in AD 312 paved the way for the edict of Milan (AD 313), in which Christianity was recognized as a legitimate religion (religio licita). The sons of Constantine abandoned the tolerant attitude and proceeded to persecute heathenism. After a heathen revival under Julian the Apostate (AD 361-363), Theodosius the Great and Gratianus from AD 381 on engaged in the destruction of heathenism and in the creation of a state-church. 8. The Religion of Rome. The old Roman religion was one of fear and awe in the presence of mysterious divine powers, coupled with methodical efforts to placate them. Even before Rome's founding Jupiter ('heaven-father') was worshipped in that vicinity and he remained the highest god to the end. His temple on the Capitol was the religious centre of both the Republic and the Empire. He was storm-god and guardian of law and order. Other gods were Mars, god of war; Saturn who guarded the crops and Ceres who nurtured them, along with Faunus, patron of the herds. Vesta, goddess of the hearth and Janus, god of the door, were worshipped in every home, but also cultivated by the State. The temple of Vesta had its six vestal Virgins, whose task it was to keep the sacred flame burning. The Romans had a tendency to develop specialized gods as patrons of all manner of activities. Those of the household were included in the general name Penates (penus, 'store-room'). Certain concepts were even deified e.g. pietas, 'reverence for one's parents.' Considerable change was wrought in Roman religion by the wars with Hannibal and the fierce Gauls. They struck fear into people's hearts and a desire to appease the anger of the gods. Much new Greek and eastern lore was introduced through the attention given the Sibylline books. The Sibyls were the oracle-priestesses of the Apollo-cult in S. Italian cities. The books of the Sibyl of Cumae were even brought to the Capitol and their advice was seriously consulted. This could even lead to the introduction of new cults, as when the goddess Cybele, the magna mater, was imported from Pergamum in 204 BC. With the rise of the Empire and of emperors a cult of emperor-worship (q.v.) arose. It served to make the provincials conscious of their dependence and of the blessings they enjoyed through the protection of Rome. In the cult of Mithras, which came to Rome in the time of Trajan and flourished under Commodus (AD 180-192) and after, Christianity faced a formidable rival. Other Hellenistic mystery cults also had their devotees, with the result that the picture of Roman religion under the Empire is one of great diversity. Rome was the residence of many Jews (Acts 2.10; 18.2) and of many Christians, whom St. Paul was anxious to visit (Acts 19.21), and to whom he wrote an Epistle. It was the scene of his first and second imprisonment, and of his martyrdom. Paul at Rome.